I’m quite proud of the PRCA today. A couple of staff members, Julie Jutten and Kent Sturman, were preparing for an annual trek from Colorado Springs, Colo., to Casper, Wyo., to take in the College National Finals Rodeo. They’re doing more than visiting. According to Cindy Schonholtz, she and Jutten visited Wednesday about the pending need for hay in the Colorado Springs area for all the horses that had been evacuated from the wildfires in the area. They were proactive and put a PRCA Trailer to use; they are going to retrieve hay from Wyoming, take it back to Colorado Springs and help feed hundreds of displaced horses. Susan Kanode, the media director for the college finals, jumped on board. She put out news around Casper that anyone wishing to donate could leave hay at the Central Wyoming Fairgrounds. My hope is that the PRCA trailer won’t be enough to haul all the donated hay and that someone is willing to haul the remaining donations as part of their donation to the cause. 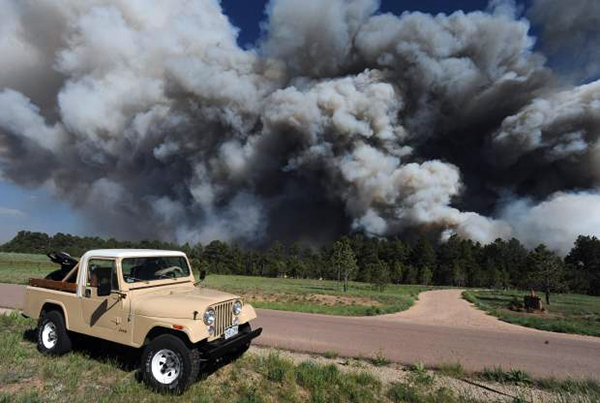 As of 11 a.m. Central Time on Thursday, the Black Forest fire has destroyed 360 homes and more than 10,000 acres. Nearly 10,000 people have been forced to flee the area near Colorado Springs.